Imagine for a moment you’re driving down a palm-lined drive, the roar of the ocean to your right, the golden roar of commerce to your left. Everything is deco, neon, and better. You see a sign in the distance, it reads “Arcade”. You mash the accelerator, your white Ferrari Testarossa surges. In seconds, you pull into your spot near the front door. You jump out, straighten your look, and walk into what many will call the best arcade in the history of the world, with amazing games playing great and more cold drinks than you’ve ever imagined. We can’t give you the ocean, the palm trees, or the Testarossa – but here at Free Play, we have most everything else. And it not being the 80s anymore, you don’t have to pay a fortune to enjoy some of the best arcade games or parties in the world. 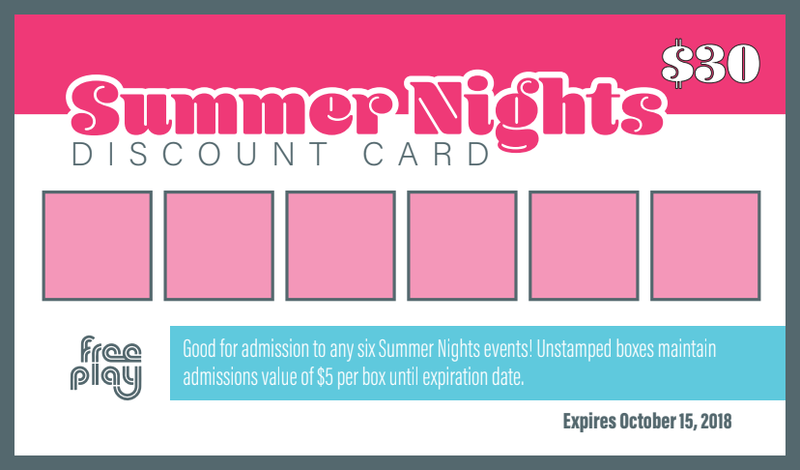 For only $30 (plus tax), you’ll have access to six Summer Nights events, whether that means you want six beer-infused arcade parties, six challenging game-focused events, or something in between – we have you covered. And if you want to use your card on a non-Summer Nights day, no problem. At any point until the card expires, each blank square on your card is always worth $5 toward a regular priced admission. Use two squares and you’re in the arcade on a non-qualifying day! For the card to work, we need a ton of events. Expect more than 40 Summer Nights events from the time it gets hot (May 29, 2018) until it starts to cool day (September 15, 2018)! Facebook Event links and details added as available. June 13 – Free Play Richardson – Pandas Unite!? June 15 – Free Play Arlington – One Year Anniversary Party w/ Calling Jack Burton! July 24 – Free Play Arlington – Tuesday Night Fights – Third Strike! July 31 – Free Play Richardson – Tuesday Night Fights – Wheel of Fighters! August 15 – Free Play Richardson – Summer Nights Brewery Event – Super Pint Night! August 28 – Free Play Denton – Tuesday Night Fights – Vampire Hunter 2! No catch. If you plan on coming to Free Play (any location) three (or more) times between May 29, 2018 and October 15, 2018, you should buy this card. If you come to an event on the list above, you will gain admission and only use one stamp spot on your card. If you come during a non-event time, you can still use the stamps to gain admission but at the standard price (two stamps = $10). At worst, you are prepaying for three admissions. At best, you gain access to six events for only $5 each. 2. Is there any specific time to arrive during an event? No. The card can be used at any time during the day at the location of the event. For example, if you arrive three hours early for June 19’s Tuesday Night Fights at Free Play Arlington, you’ll still gain access to Free Play Arcade for only one stamp. 3. If I forget to use my card, does it still hold value? From the time you purchase your card until October 15, 2018, each stamp spot can be used for $5 toward admission to Free Play. If you use the card to enter a qualifying event, only one stamp will be used. If you regularly attend Free Play events, you’re looking at half-off admission for your next six events! All cards do expire on October 15 though! So if you do not plan on coming to Free Play at least three times from the time you purchase your card until October 15, you shouldn’t buy the card! 4. What can I expect at a Tuesday Night Fights event? Twenty+ players playing a diverse range of fighting games. We routinely have a diverse blend of players ranging from the best in the area to novices. We routinely run special structures that ensure substantial play-time and opportunity for all players. Free Play has one of the largest retro fighting game collections in the world and a community to match it! 5. What can I expect at a Summer Nights Brewery event? We do brewery events bigger and better than any arcade in history. Expect tons of brewery swag from some of our favorite breweries, Summer Nights Free Play swag, and challenges throughout the arcade. It’s a big deal! 6. Where can I find out more details on specific events? Each event will have its own Facebook event page posted about two weeks before the event with additional details. The master list of events is above.